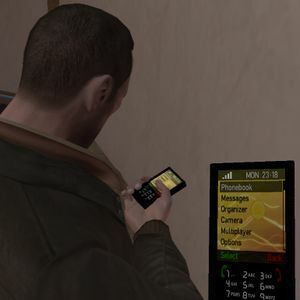 Difference between revisions of "Cheats in GTA IV"
In [[Grand Theft Auto IV]], [[The Lost and Damned]] and [[The Ballad of Gay Tony]], '''cheats''' are activated by bringing up the phone number pad and typing the cheat phone number into [[Niko Bellic]]'s, [[Johnny Klebitz]]'s, or [[Luis Fernando Lopez]]'s [[Cell Phone|mobile phone]]. After this has been done once, the cheat will be stored in the phone, and accessible from the "Cheats" menu there. Note that the [[PlayStation 3]] version of GTA IV needs to be updated in order for trophies to work. *Another cheat to get full health, armor, ammo and repair one's vehicle can be used if the player is driving the [[Mr. Tasty]]; cycle through the ice cream jingles (using the horn button) until the GTA IV theme plays, then call the [[ZiT]] Service (948-555-0100). Although not documented as such, this will block the achievement/trophy 'Finish Him'. *Note that outrunning cops who try to stop the player skipping islands when Niko is in a spawned [[Jetmax]] will NOT give the Walk Free achievement but can be obtained later on in the same save file after being killed. *If the player has completed all 30 of [[Stevie]]'s Car theft missions, Stevie will pay cash for almost any car delivered to his garage. Using vehicle-spawning cheats, the player can exploit this arrangement for as much money as he or she wants. Below are the prices of the (eligible) spawnable vehicles; keep in mind that this table is presuming that the car is just spawned and has not taken any damage. *When riding around in a cab, entering and using cheats do not block acheivments for the 360. Most cars have a low sale value, however driving gently into a wall (enough to scrape the paint) will dramatically improve the value of certain cars. For example, when the [[Cognoscenti]] is spawned and sold in perfect condition, Niko will get $8,000; scraping the car against the wall of the garage while entering will change the payout to the full retail value, $10,500 (some have reported the value further increasing to $10,800). Presumably this is a game bug. The downloadable content adds cheats to spawn new vehicles. These do not block any achievements or trophies. In addition, any of the cheats from the main game can be used, and do not block any [[Achievements in GTA IV|achievements in The Lost and Damned]]. This list of phone numbers can be found at [[The Lost Brotherhood|The Lost]]'s clubhouse in [[Acter]], in the form of a flier listing the vehicles either for sale or as a prize for a contest. This list of phone numbers can be found at [[The Lost Brotherhood|The Lost]]'s clubhouse in [[Acter]] or on the Lost MC website, in the form of a flier listing the vehicles either for sale or as a prize for a contest.